Our individual residences are easy to love, but you deserve more than a nice room. That’s why West Broad features incredible communal spaces that go outside-the-room. Check out these amenities that would seem more at home in a 5-star hotel than they do your friendly neighborhood apartments. Summer nights at West Broad are resplendent with fire pits and hearty laughter. The Yard is a big reason why. The Yard is one of West Broad’s premier outdoor spaces. This large courtyard terrace includes everything from comfortable seating and resident-reserved grills to outdoor TVs and a communal speaker system. The fully-equipped bar is ideal for wine and beer tastings, and the accompanying dining tables make The Yard an astounding social space. If you’re fixing to get a bird’s-eye view on Falls Church, the Broadview Observation Deck has you covered. The comfortable seating in this elevated space makes it the perfect venue for viewing fireworks, parades and other Virginian spectacles. On quiet nights, you can glide out into the mystical moist night-air and look up in perfect silence at the stars. Our Sky Den takes the lofty locale of our Broadview Observation Deck and wraps it into an indoor entertainment room. Don’t worry—we’re prepared for sunny days, too! Our resort-style swimming pool is ready for laps or relaxation, depending on your mood. The roomy deep end is carefully balanced by a shallow lounge section, where you can recline in the sun with only your feet in the water. There’s plenty of room on the sundeck to sprawl out on dry ground, too. You’ll walk away from a day by the poolside feeling as though you were just aboard a luxury cruise ship. Coziness just got a whole lot more competitive. (Or did the competition get cozier? Hard to say.) Replete with HD TVs, plush seating and roaring fireplaces, the Cue and Hearth is the warm and gooey center of West Broad. 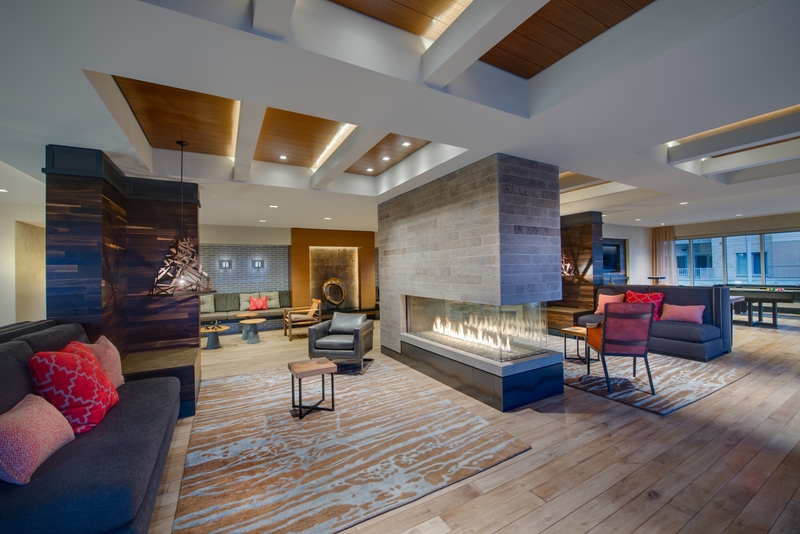 This clubroom will be your destination for billiards and fireside relaxation. If there are too many residents taking advantage the fireplaces and the granite-topped bar, there’s always the option of retreating to The Alcove, an isolated room ideal for private meetings or card games. West Broad is dedicated to providing an unmatched experience to all of its residents. Our features and amenities alone set us apart, not to mention our uncompromising service and idyllic neighborhood. So if you’re ready to live a little, get in touch with us today!